We would really like to use the distributed switch in VMware cluster. There seems to be a lack of documentation on how to properly implement it with Nutanix. 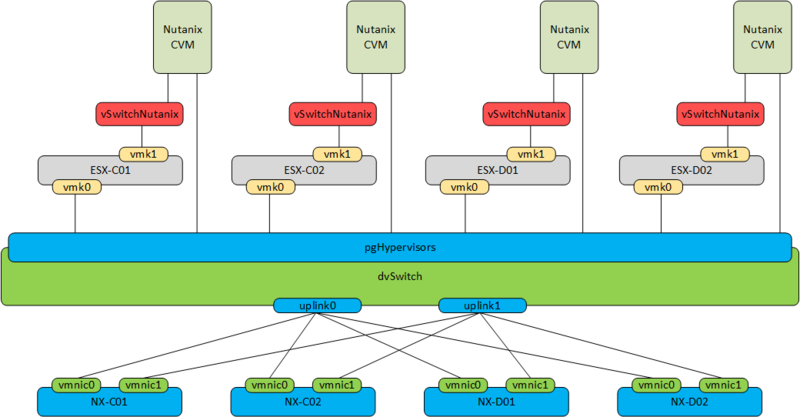 For example I seem to remember that the Nutanix controller VM’s should not be moved from their installed switch and they have to be able to talk to vSphere and or the ESXi hosts. But if I want to put vSphere and the ESXi hosts into the dvSwitch and how do I do this? I might not be wording this question correctly, but one of the goals would be to have traffic separated by VLAN and protected by QOS where necessary. Is there documentation on how to do this correctly in a Nutanix environment? Has anyone tried to do this? If not, log in to the Portal, and under Documentation, go to Knowledge Base, then search for "Distributed Switch". We created a distributed switch and it works flawless. You only need to watch carefully which ports you are migrating. I created a picture of how it logically looks for our documentation. The NX-C01, NX-C02 are our Nutanix nodes. A small sidenote which already has been submitted as a bug is that NCC (Cluster health tool) won't notice 10Gb/s interfaces and will report this as a problem when using a dvSwitch. If it is broke, fix it. If it ain't broke, make it better! The other two posts covered that it's possible, so I'm just writing to validate that we actually have implemented the Nexus 1000v in our environment successfully. We were able to successfully and seamlessly transition all of our VMs from the standard switches to the Nexus 1000v dvSwitch by having one uplink to the standard switch and another uplink to the dvSwitch. Once you've migrated all VMs to the dvSwitch, you can safely remove the uplink to the standard switch and add it to the dvSwitch for redundancy. I have customers using DVS (and a Nutanix SE confirmed there is at least 2, maybe more, using Nexus 1000v), so it's definitly working. I think the only standard vSwitch you cannot modify is the internal vSwitch, the one used for NFS traffic over the 192.168.5.x subnet. Other than that, the rest is standard vSphere Network, so you can migrate your VMkernel ports over to a DVS like you would on a non-Nutanix ESXi.